The livestock bill of sale is for the transfer of possession of any farm animal including but not limited to: (cows), pigs, horses, chickens, hens, etc. 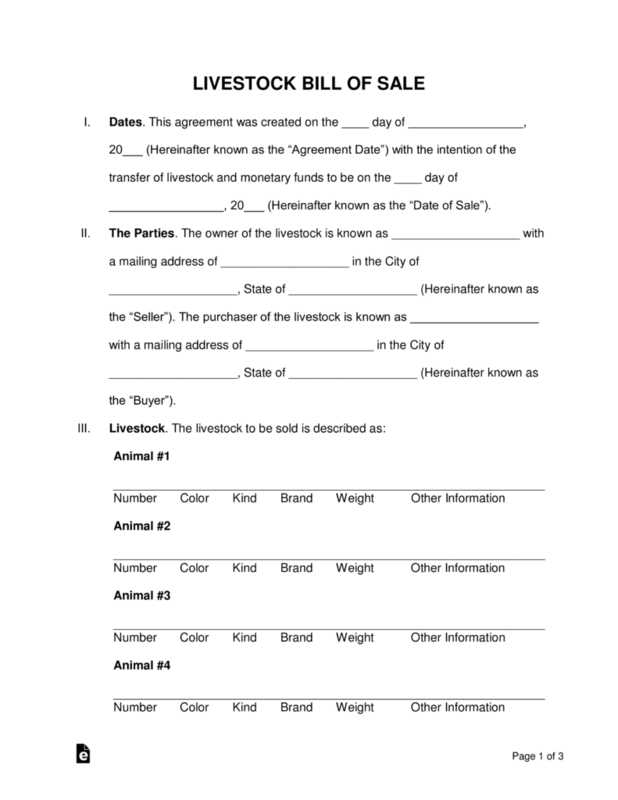 The buyer and seller shall come to an agreement using this document and schedule a date of sale where the animals will be presented along with the monetary funds for the transfer of possession. The buyer is allowed, and recommended, to inspect or have a third party examine the health of the animal(s) between the agreement date and date of sale. If there are no health issues, the sale shall be finalized after the exchange has been made, with the bill of sale being authorized (recommended with two (2) witnesses, and/or notary public). The Livestock Bill of Sale should be used any time livestock is being sold from a seller to a buyer. This includes private sales and auctions, and livestock includes many farm animals such as cattle, swine, sheep, goats, chickens and other farm animals. This form serves as a proof of purchase and indicates the who, what and when of the sale. You may also want to have a Certificate of Acknowledgement from a public notary as additional insurance of the final sale terms. Copies of the bill of sale should be given to all parties to keep on record in case of disputes. Now that you know about the Livestock Bill of Sale and what it involves, it’s also important to know how to sell your livestock. Below, we have a simple list of common dos and don’ts when selling livestock. Download our Livestock Bill of Sale form here if you want to securely, safely sell your livestock. It will save you a lot of hassle in the long run. We make it simple for you to fill out. Just fill in the required areas with all the necessary information mentioned above.